What does LGS stands for? How many branches does LGS have? How are LGS branches named? How many zones LGS has? LGS has two zones,North and South. LGS has divided its branches according to geographical location called zones.North Nazimabad is North Zone,Clifton is South Zone. How many branches are in each zone? 6 branches are in North Zone, 2 branches are in South Zone. What are LGS color codes? Rainbow branch North Zone,Violet branch South Zone. 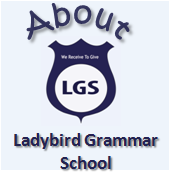 Does LGS School have branches in other cities? NO, currently we are only operating in Karachi city.